STEUBENVILLE, OHIO (CNS) — Franciscan Father Michael Scanlan, whose name is almost synonymous with the Franciscan University of Steubenville, died Jan. 7 at Garvey Manor, a Catholic nursing home in Hollidaysburg, Pennsylvania, after a long illness. He was 85. 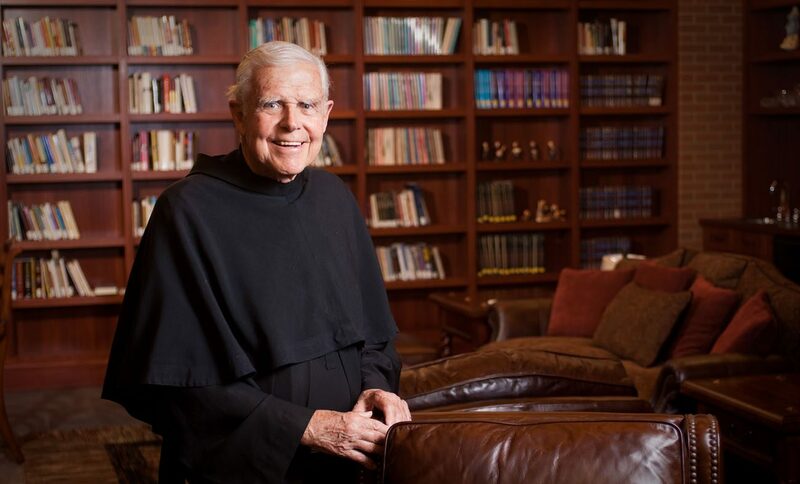 Father Scanlan’s funeral arrangements reflect his involvement not only at the school but also his roots with his order: Third Order Regular Province of the Most Sacred Heart of Jesus, based in Loretto, Pennsylvania. A viewing and wake was scheduled Jan. 10 at the university’s Christ the King Chapel and a memorial Mass was to be celebrated at the school’s fieldhouse Jan. 11. A viewing and vigil service also was to be held Jan. 11 at St. Francis Friary in Loretto, followed by Mass of Christian Burial Jan. 12 at the Chapel of the Immaculate Conception at St. Francis University, Loretto. “The good he has done for the Province of the Most Sacred Heart of Jesus, for the order, and most importantly, for the entire church is a tremendous source of honor. I thank God he was my brother, my mentor, and my friend,” he said in a statement. Father Scanlan was born in 1931 in Cedarhurst, New York. He received a bachelor’s degree from Williams College, in Williamstown, Massachusetts, and law degree from Harvard University in 1956. After serving as staff judge advocate in the Air Force, he decided to become a priest and was ordained as a Franciscan Third Order Regular in 1964. He also co-founded a national Catholic evangelization ministry called FIRE, for Faith, Intercession, Repentance and Evangelism, and hosted the theology discussion program “Franciscan University Presents” for 18 years on EWTN. A champion in the pro-life movement, Father Scanlan established President’s Day in January so students could attend the national March for Life in Washington without missing classes. In 1989, he was jailed after participating in a peaceful protest outside a Youngstown, Ohio, abortion clinic.